Compared to most other German cities, Glückstadt is very young. The town doesn’t date back to dark medieval times. Its history can be followed continuously from the days of its foundation until today. Glückstadt is located in the last large part of the marshlands that was won from the Elbe: in 1614, the King of Denmark, who was also the Duke of Schleswig and Holstein, decided to tame the ‘wilderness’ (‘Wildnis’ in German), as this area is still called, with dykes. As part of his far-reaching political and military plans, the aspiring king wanted to found a fortified town on this ground as a bridge head into Lower Saxony. In addition, he begrudged the citizens of Hamburg their successful maritime trade. A new town on the Lower Elbe was to be the means by which his kingdom would gain access to this source of income. From a modern point of view, this plan seems unrealistic, but in the early 17th century, the city of Hamburg with its approx. 40,000 inhabitants was only just beginning to develop into an international trade metropolis. The king’s new town was also planned to be large enough to become a serious competitor for Hamburg. What’s more, the main shipping channel back then was still rather close to the riverbank on the side of Holstein so that any shipping traffic could be controlled and governed from the town. In November 1615, the wilderness was finally surrounded by dykes. A few months later, there was already a ‘kleines Stetlein’ (little town) and the first plans for the ideal ‘town and fortress’ were made. The intention was for a regular hexagon, but in the end only the eastern, inland part of the town was constructed in accordance with these designs: a number of radial streets lead off from the central marketplace at the heart of town, like spokes from a hub, running to the town’s bastions (about 250 metres away) and are connected with an outer ring or bulwark street. The radial streets are additionally connected by a second ring street at two thirds of the distance between the centre of the market and the outer ring street. For military reasons, these streets were built in a straight line and their houses had no balconies or oriels that could provide enemy soldiers with cover. The design of Glückstadt is a symbol for the absolute will of a sovereign. On 22 March 1617, the official birthday of Glückstadt, Christian IV bestowed the ‘newen Statt’ (new town) with name, town charter and a coat of arms showing Fortuna, the goddess of luck. Soon, Glückstadt was outperforming Itzehoe, Krempe, Wilster and other larger settlements in Schleswig-Holstein in terms of population and power. Starting in 1620, the King deployed almost 1,000 soldiers as well as an enormous amount of material and money to enable the rapid expansion of the town and, especially, its fortifications. Moats were dug; ramparts, earthworks and bastions built; supply houses, guardhouses, armouries, gates, gunpowder towers, a cannon foundry, supply mills and bakeries constructed; complicated drainage and irrigation systems designed; and a harbour as well as a wide town’s canal for shipping, running from north to south through the entire town, were set up. As a result, Glückstadt was the only town in the entire country able to successfully withstand a siege by Wallenstein’s army during the Thirty Years War in 1627/28. After the separate peace of Lübeck between Denmark and the Catholic army in 1629, Glückstadt became the centre of Danish activities in Schleswig-Holstein and, in addition, as the King’s German residence, it was used as his base of operations against Hamburg and the dominions on the other side of the Elbe. 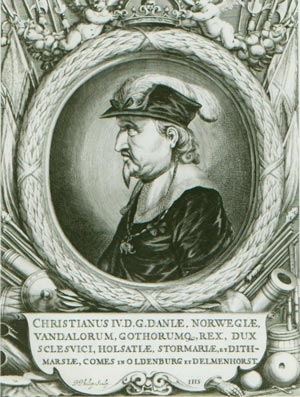 In 1639, Christian IV decided to double the new town’s size by expanding it towards the south. Due to the war with Sweden, however, these plans came to a halt in 1643 and were finally abandoned in 1648. A significantly shorter version of the fortification belt south of the harbour was completed in 1656. 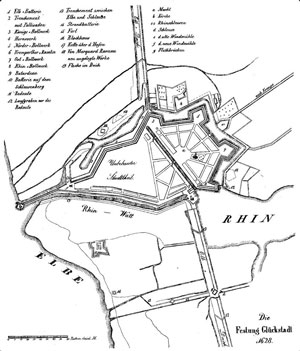 These fortifications marked Glückstadt’s boundaries until their demolition between 1814 and 1816. With Sweden’s failed attempt to capture Glückstadt, Holstein was successfully defended against Sweden in 1644/45. The fortress seemed to be impregnable. For this reason, the seat of the government of Schleswig and Holstein was moved from Flensburg to Glückstadt in 1649, followed later by a number of high courts. Glückstadt was henceforth the royal capital in this country until the retreat of Denmark in 1863 when Kiel became the new seat of government. In 1867, Schleswig-Holstein became a Prussian province. Our town was able call itself a royal seat as early as 1630 as King Christian IV had built a small castle at the harbour and, at some distance from it, a royal garden and pavilion. Due to its decrepit state, the castle had to be torn in 1710. The large palaces (‘Palais’), however, built by noble members of the government, are still witness to the town’s history as a seat of government. Glückstadt was not only a garrison, fortress and royal seat, but also, especially in the 17th century, an international harbour and trading centre. This was mostly due to two population groups that had left their home countries mainly for religious and political reasons: Portuguese Jews and Dutch Protestants. Glückstadt strongly benefitted from their capital, their ships and their global trade connections. At the end of the 17th century, as it became clear that Glückstadt could not even come close to matching Hamburg, the foreigners left our town again. This is the main reason why military and government left a much bigger mark on Glückstadt than merchants and trade. The 2,000 soldiers of the Danish Queen’s Guard, the officers, the authorities’ civil servants and the government contracts for the maintenance of garrison and fortifications were the basis of existence for Glückstadt’s citizens. From around 1700, they mostly worked as Herbergierer (hostel wardens), servants, craftsmen, merchants and grocers or as ferrymen. As of this point, the town could gather no further momentum with regard to its development. On the contrary, the fortress’s strategic value became somewhat questionable during the course of the 18th century. In 1813/14, the town was no longer able to successfully withstand a siege by Napoleon’s enemies. Since Denmark and France were Allies, the fortress was demolished after their defeat in 1815/1816. From this point on, Glückstadt had only a small garrison whose main task was to guard the town’s prisons with their up to 600-800 inmates. Despite all the hostilities, Glückstadt was allowed to continue in its role as the seat of government. It is due to this circumstance, that our town was connected to the railway line Altona-Elmshorn-Kiel (built in 1844) as early as 1845. Although the authorities were moved from Glückstadt in 1863, the railway line remained and provided the town’s economy with new opportunities. In 1875, the line was extended to Tondern, north of Glückstadt, and our town became the headquarters of the Marschenbahn (Marshland Railway). 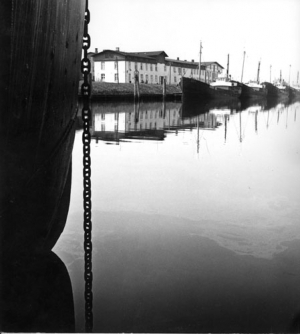 Perhaps as kind of a compensation for the loss of the seat of government, the new rulers of Schleswig-Holstein built a dock lock between 1867 and 1874 which made it possible to use half of the town’s harbour as a tide-independent wet dock. In 1670, the first civilian shipping company opened an office near the harbour in Glückstadt. For the first time, whaling and sealing ships from Glückstadt sailed to Greenland. In 1818, the Greenland fleet consisted of 17 ships. From this time on, the former Admiralty building on the opposite side of the harbour at the location of today’s Youth Hostel (Am Rethövel) was used for the boiling of blubber. The last trip of a whaling ship from Glückstadt took place in 1863. In 1893, a new company founded by the local residents took over the former admiralty: the Glückstadt Herring Fishing Company. The company’s herring luggers sailed the North Sea until 1976. The immature herring they caught every year in May/June, the so-called Matjes (soused herring), established Glückstadt’s Matjes tradition that is still upheld today. The Glückstädter Matjeswochen (Matjes season, opened by a four day-long spectacular in mid-June), held since 1968, start every year on the second Thursday in June. Whereas whaling and herring fishing is now a thing of the past. The town’s polygonal and radial layout from the early 17th century is still visible today. Due to this absolutely unique layout with its four preserved historic palaces, the uniform row of houses along the harbour and some former fortress buildings such as the large Provianthaus (Provisions House), the town of Glückstadt was awarded the status of “Historic Town” a few years ago. As a result, Glückstadt received a significant amount of federal and state subsidies, which made it a focal point for restoration and old town reconstruction in Schleswig-Holstein. Thanks to these comprehensive restoration efforts, Glückstadt has become a real jewel of a town.